Home :: Necklaces :: N0014 - Filagree Heart Pend on Iolite & Garnet necklace - 18"
N0014 - Filagree Heart Pend on Iolite & Garnet necklace - 18"
One of a kind design! 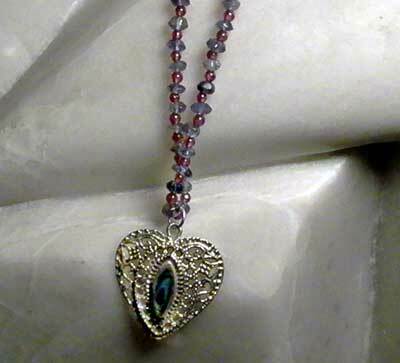 Mysterious Iolite rondels flash purple and blue hues as they are seperated by 2mm garnets, highlighted by a sterling silver filagree heart pendent inlaid with Paua shell. 18" length, SS heart shaped lobster clasp.